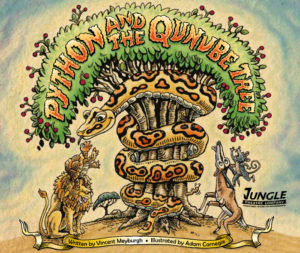 Jungle has recently published their first book of their show Python and the Qunube Tree. The book is illustrated by Adam Carnegie and written by Vincent Meyburgh and comes in a full colour or colouring-in version. Donate a minimum of R200 to receive a copy of the book. Please email us for further info. We are also working on publishing a book of our show When Lion had Wings.